The "Grade B" listed flat was originally built as a tenement pretty much exactly as you find it today. 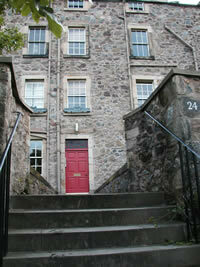 This was one of the first purpose-built multi-occupant buildings outside of the Old Town of Edinburgh. It was built in the 1770s, and just pre-dates the New Town. We still have the original deed of sasine (the old Scottish instrument of conveyance) which is printed in grand style on vellum, dated 1772 and made out to one "William Munro & fam., Architect". The building has been the home to Edinburgh professional class ever since. Across the street is part of the Old Calton Cemetery with graves from the 17th c., and includes such illustrious "tenants" as John Hume. The full graveyard was cut in two by the creation of Waterloo place in the mid 18th century, just before the flat was built. You should definitely visit the Old cemetery that is open to the public, across Waterloo Place, if you wish to visit the small portion that is on Calton Hill across the street, we can sometimes provide access. The Grade-A listed characteristic wrought-iron castle window boxes on our flat were introduced in the late 19th century and are unique in Edinburgh, appearing occasionally on travel and cultural books and programmes. Two doors up, on 28 Calton Hill, known as 'Rock House', was the home of the famous 18th century photographer James Hill -- he is credited with inventing many of the modern techniques of photographic development and was the worlds' first commercial photographer.